Tallahassee is more than just the capital of Florida. It is a mid-sized city with a big personality! Home to many residents, students, and legislators, as well as two universities (one designated a Silver-level Bicycle Friendly University) and a community college, Tallahassee is an All-America City and a Tree City, USA. This year, it was designated a Silver-level Bicycle Friendly Community. This came about because Tallahassee is making big strides toward becoming more multimodal and embracing a bicycle-friendly mentality. Tallahassee’s movement towards becoming more a multimodal city has been steady, and has gained even more momentum in recent years. This is largely due to a supportive local government, strong cycling community and overall citizen enthusiasm. This combination has fostered a great number of network enhancements and infrastructure improvements, and has ensured both Tallahassee and Leon County have funding for future projects. Because of this support network, citizens voted to renew a penny sales tax extension to help continue the implementation of transformative bicycle infrastructure improvements, and continue to build a comprehensive cycling network. Starting in 2020, $1.5 million a year will be dedicated specifically for bicycle, pedestrian and trail infrastructure. The previous 20 years of funding included numerous bicycle facility improvements, including the addition of a shared use path along Capital Circle Southeast (a major state arterial road), the application of complete streets, which emphasizes good design to facilitate safe access for all users, to Franklin Boulevard by adding both on-street bike lanes and a separated urban trail, the Magnolia Road trail, and others. 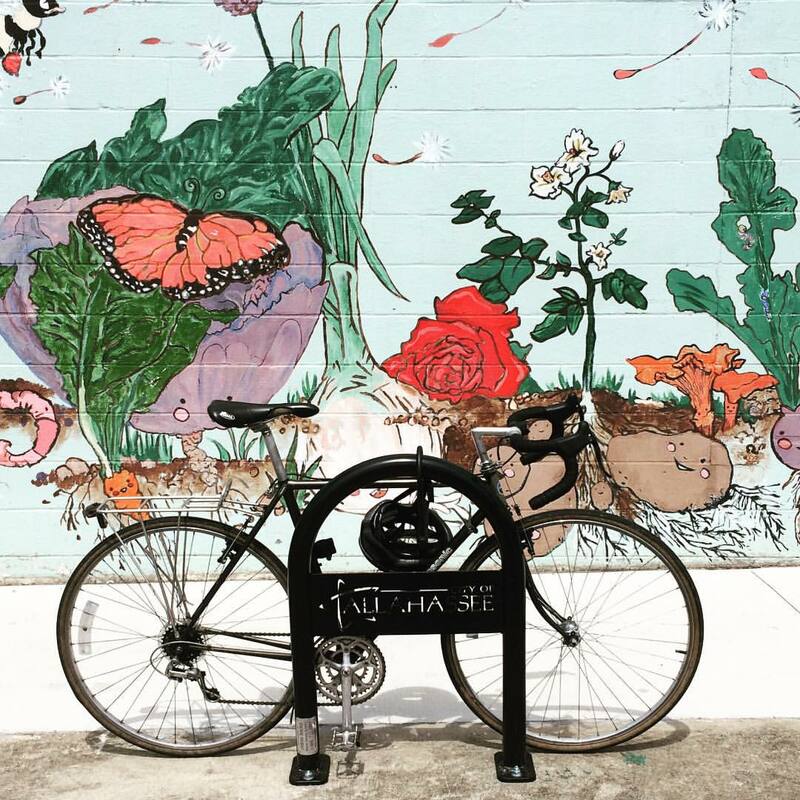 Today, Tallahassee is home to a comprehensive bicycle network, including protected bike lanes, bike boulevards, bike boxes, buffered bike lanes and trails, in addition to traditional bike lanes. These facilities are complemented by a City Bike Parking program, which strives to provide bicycle parking throughout Tallahassee. Bicycle corrals and standalone bike racks can be seen all around the city, with more being installed as new locations are identified. The Joint City/County Bicycle Working Group, a City/County citizen’s committee consisting of an active group of bicycling enthusiasts, was, and continues to be, instrumental in identifying locations where new bike parking is installed. There is always room for growth and improvement, so roadways are evaluated for the feasibility of adding for bicycle facilities when they are resurfaced, and new roadways include bicycle facilities, either through on street bike lanes or off street multi-use paths, and sometimes both! In the years 2017 and 2018, there were many multimodal enhancements in Tallahassee, and several projects came online. These included the launch of Pace Bike Share and the renovation and expansion of a new east/west multimodal corridor on the southwest side of town, FAMU Way. 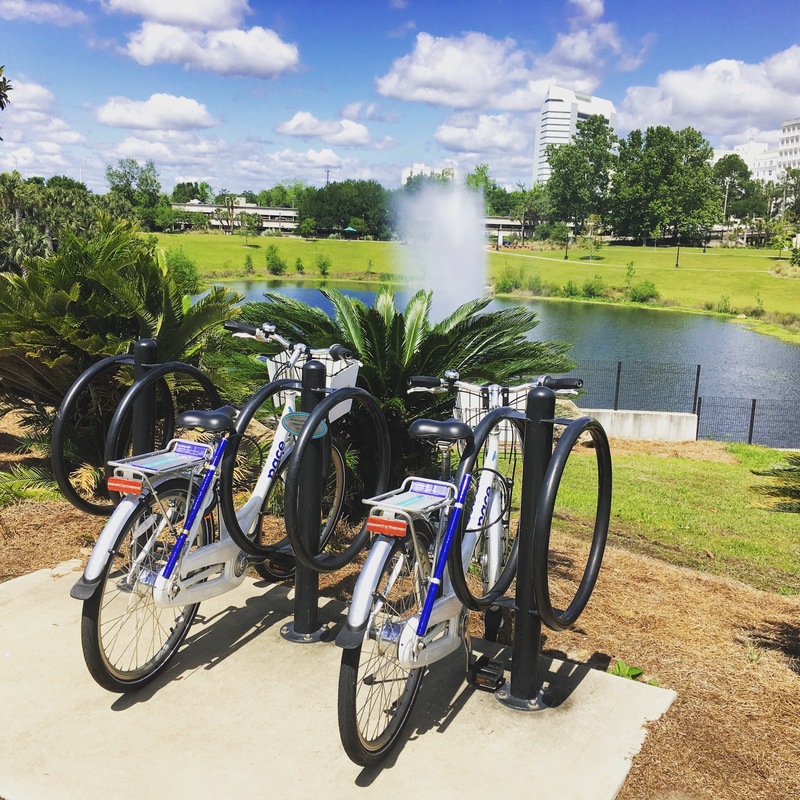 In December 2017, the City of Tallahassee partnered with Zagster to launch the first Pace Bike Share in the country. Pace utilizes a lock-to model of bike share, which allows users to start or end their ride at any public bike rack, and not only at a designated station. This model is really popular, and Pace bikes can be seen throughout the city. This system uses the preexisting City bike racks in tandem with dedicated Pace stations and allows people to check out or return bikes from either. Pace is continually evaluating where to place new bikes and new racks to provide mobility options to the citizens of Tallahassee and Leon County. Likewise, FAMU Way has been undergoing renovations and expansion for the past several years to become a comfortable roadway for cycling, with both a shared use path and on-street bike lanes. This is the second roadway to undergo a complete streets facelift, following in the footsteps of Franklin Avenue. Both roads connect to the Capital Cascades Trail, which connects to Cascades Park, home to many shared use paths. Connecting Cascades Park to FAMU Way is an iconic connector bridge over South Monroe Street, a major state arterial roadway that was historically a barrier to bicycle and pedestrian connectivity downtown. Just this year, there have been roughly 26,000 bicycle trips and 72,000 pedestrian trips across the bridge. The addition of the bridge has played a major role in connecting Cascades Park (an award winning regional park) to Florida A&M University, Florida State University, Railroad Square (a popular art park) and Gaines Street (a lively commercial corridor downtown). This bridge serves a twofold purpose: to provide a safe passage for cyclists and pedestrians over a busy corridor and to help remove pollution from the air through nanotechnology. Looking forward, Tallahassee’s cycling community is most excited about the connection of the St. Marks Trail, a rail-trail that runs from Tallahassee to St. Marks, Florida. The rail-trail will connect both to FAMU Way and to Gaines street near FSU, providing a long sought after solution to a missing link. At the same time, the Capital Regional Transportation Planning Agency — our Metropolitan Planning Organization — is working on the Capital City to the Sea Trail, which will connect the St. Marks Trail to Panacea, the Ochlockonee Bay Trail and the St. Marks National Wildlife Refuge. Once the Capital City to the Sea Trail is completed, cyclists will be able to ride from Tallahassee all the way down to Panacea (over 50 miles each way) on a separated, paved, multi-use path. A bicycle and pedestrian master plan is also in the works, and will help identify and guide future investments in bicycle infrastructure. But, it would be remiss to discuss Tallahassee’s multimodal improvements without bringing attention to the strong and vibrant social infrastructure that is constantly advocating for positive change. There are multiple bike clubs that each host their own events and have their own followings. There is the Joyride Bicycle Collective, which is a community of bike minded people in Tallahassee who want to support, grow, and encourage biking as transportation in the city; Capital City Cyclists, a Florida based non-profit organization with a purpose of promoting bicycling for transportation, sport, health, and recreation through education, advocacy, and rider development in the greater Tallahassee area; and, the Tallahassee Mountain Bike Association, which strives to work collectively with land owners/land managers to expand trails, build community by integrating mountain biking into the Tallahassee area’s culture, and provide rides of varying skill levels to encourage participation, among other ambitions. Tallahassee has a bike polo club, bike commuter club, university bike clubs and two nonprofit bike shops that not only provide bicycles to community members, but provide a space for people to have access to the tools necessary to work on bicycles. It has never been easier to get around Tallahassee on a bike, and we will continue to pedal toward a safer, more connected, more multimodal city with the hope that the next time we apply for a Bicycle Friendly Community designation, we hit Gold (or better)! Julie Conn Christesen, AICP, is Senior Planner with the Tallahassee-Leon County Planning Department.